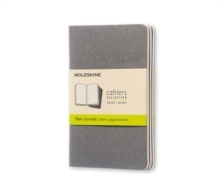 Like comfy jeans on the weekends, the Moleskine Cahier is casual yet durable. 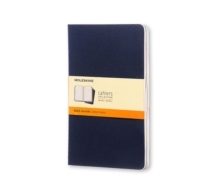 A journal for all occasions - it's soft, light and fits in every pocket. A flexible cardboard cover houses the acid-free paper pages, while the thread stitching is visible on the spine. The back cover has a spacious pocket for notes or clippings, and the last 16 pages of each journal are detachable. Available in black, Kraft (tan brown), red and navy each set contains three notebooks and comes with a removable card with the history of Moleskines.